Originally scheduled to be released on October 29th, both The New Teen Titans Archives Vol.4 HC & Superman Vs. Brainiac TP are now set for release on November 5th. 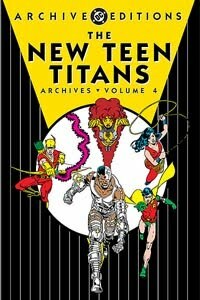 The 1980s adventures continue in this final Archive edition, collecting NEW TEEN TITANS #21-27 and NEW TEEN TITANS ANNUAL #1! Don't miss the Titans' struggle against the hordes of Brother Blood, Starfire's confrontation with her evil sister and more!